If there had been a poll among modern Soviet armor fans asking what were the ten kits you’d like to see in plastic then it could almost be guaranteed the Czech built 152mm DANA Self Propelled Artillery Gun would have definitely have made it into the top ten. So it was with much excitement that the news from HobbyBoss that they were working on one was received. Since the announcement in Autumn 2010 there haven’t been too many pictures apart from the CAD ones that most manufacturers seem to be so fond of now. In any case the moment has arrived for fans of this interesting piece of armor. The 152mm Samohybná Kanónová Húfnica Vzor 77 (ShkH vz.77 or self propelled gun howitzer model 77) or Dělo Automobilní Nabíjené Automaticky (DANA) was the Czechoslovakian answer to the Russian 152mm 2S3 Akatsiya tracked SPG. The DANA was one of the first truck or wheeled large calibre artillery pieces when it was designed in the 1970s by ZTS Bubnica nad Vahom. By the time it was accepted for service in 1981 the South Africans had developed a 6x6 155mm Howitzer. 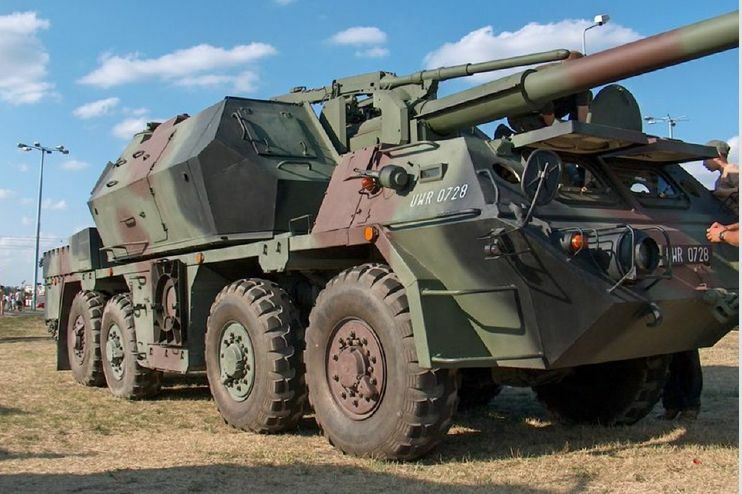 In the early 1990s the French began work on the 6x6 GIAT CAESAR 155mm gun and in 2000/2001 Soltam Systems in Haifa began work on a 6x6 155mm gun, the ATMOS 2000, for the IDF. However, the DANA was the first, and perhaps the most successful and widely used, of these vehicles. Based on a Tatra 8x8 truck the vehicle was, and is, quite advanced. It includes an enclosed and armoured cab for two (driver and commander) plus room for three crew in the turret with the gun splitting it into two halves down the middle (Gunner and Loader on left side, Ammo Handler on right with a DhSK mounted outside his hatch).The turret is mounted on the middle of the truck chassis, between the front and rear wheels. The engine sits at the very rear of the vehicle. For the time, the auto loading system was a major advancement in artillery design and allowed the gun to be loaded at any elevation allowing a fire rate of three-four rounds per minute for up to thirty minutes. There is a usual complement of sixty projectiles stowed in the turret and chassis. Unfortunately at the time it was built the DANA did not include a modern style Fire Control System or automated aiming devices, relying on a panoramic telescope which meant any area that would be used for a fire base would have needed some preparation and planning. The latest model of the Czech DANA, the MODAN (which is 155mm), has many of the latest technological devices and an increased fire rate (six rounds for first minute, thirty rounds in ten minutes sustained) making it one of the most advanced artillery systems in use today. This was actually based on developments in Slovakia on the DANA which upgraded the electronics, fire rate and converted the gun to 155mm to comply with NATO measurements. By 1994 750 units had been produced and ZTS are still producing the gun today to meet any placed orders. The DANA (including MODAN and Zuzana) is in service currently with the Czech Republic, Libya, Slovakia, Poland, Georgia and Greece. In 2008 the DANA saw action with Georgian forces during the Russian invasion of that country in 2008. Several are thought to have been destroyed and some were rumoured to have been captured by the Russians. It’s big. VERY big. To be honest I wasn’t really sure what to expect with this kit. With a tank or even a truck kit in 1:35 you come to expect a certain size and you know roughly how the assembly will go before you actually open the box. But this is neither truck nor tank but quite a bit of both with a large turret and 8 wheeled truck body to produce. So in the box you get 14 sprues in HB’s familiar tan plastic. In addition some of the major parts are separate moulds including the turret and truck flat-beds, a two piece cab and two piece turret. In addition there is a small clear sprue for headlights and some vision ports plus a small sheet of clear pre-cut acetate for the front cab windows. There is also a large sheet of etched metal and two identical smaller sheets plus a brass cable, two springs, eight rubber tyres and a sheet of decals...phew! The instruction booklet is A4 landscaped, stapled and runs to 31 pages with 34 steps! A color A4 page is also provided with four color schemes (more on this later). For most kits released today there has been one preceding it, maybe recently and maybe not so recently. For the DANA the only predecessor in 1:35 I am aware of (vaguely) is an old resin version. Thus there is nothing really to compare it to in terms of whether it has improved etc etc. Personally speaking, I enjoy Hobbyboss’ modern releases and while they may not have as many etched parts or options as a Dragon kit they are good and accurate. The mouldings on this kit are crisp and clean. I have seen no flash on any part and the sink marks are well hidden on inner, unseen surfaces. Delicate parts are well protected with some bubble wrap and a cardboard box in the middle keeps the turret halves safe. As for accuracy I am currently waiting on a CD with a detailed walk-around of the DANA and I will withhold any major comments on this until I can compare the real thing with the kit. From what I have seen in photos online there appears to be little in the way of mistakes. The front cab is suitably busy with headlight guards and hand holds moulded very finely. Inside the cab the detail is good and suitably busy with several well detailed control panels and seats. I see no reason not to have an ‘open hatch’ policy here. The turret itself, while not appearing terribly adorned or busy on the artwork, appears much more so in the build stages with well detailed hatches, access doors and handles. My own problem here is the pioneer tools (especially the axe) appear too chunky. There is no turret interior parts included apart from a little on several access hatches so any ‘open’ turret posing would be rather fruitless but perhaps an aftermarket company will pick this up as there are some large access doors which could really show of detail where there any. Another let-down (most likely expected by most) is the barrel. Since this is pretty much the business end of an artillery gun a two piece mould is not something to look forward to. It appears well moulded but would it have been so hard to have a one piece mould or even a turned metal barrel since the gun is so prominent? I can’t help but thinking other manufacturers would have done this. A small fret with the turret-mounted DhSK is another highlight being very well detailed. As for the truck-body it is a fairly straightforward (if lengthy and detailed) build with a partially detailed engine block and some very busy suspension arms and wheel mounts. The eight wheels are plain rubber with no logos, although this appears to be correct from photos I’ve seen. For those of you who like photo-etch brass there is plenty to choose from. One of my favourite parts of the kit is the nice rear mud-guards in brass with a ‘TATRA’ logo in raised letters- should look fantastic with some careful weathering! In addition, for a couple of small parts at least, there is a plastic jig to shape the photo-etch which should be a big help to those who aren’t masters at the dark arts of PE prep! For those who don’t like photo-etch there do not appear to be any injection moulded options to replace the PE parts. The only build options is to have the firing stabilisers folded down and there is no guidance as to how to stow them but looking at the pieces and the instructions it should be a case of simply cutting the extending hydraulic arms and gluing the plates in the up or stowed position. These are up to HB’s usual standards in that they are well laid out and apart from one or two places they are uncluttered and go forward slowly but surely enabling this huge kit to come together nicely. Four paint schemes are detailed in the box with a full color A4 sheet also detailing where the small decals go. However, that is pretty much where the info ends. There is no mention of nationality or units. Option ‘I’ is olive drab and is the version in the artwork with the Czech Army roundels on the cab and turret sides. Option ‘II’ is a tri-tone with green, flat black and wood brown. I am not sure as to the nationality of this vehicle. Option ‘III’ appears, from the number plate, to be another Czech Army vehicle but there are no roundels like the one in the box art. The color scheme for this is light green, dark green and flat black in a tri-tone. Option ‘IV’ is, judging again by the number plate, a Georgian Army vehicle in olive drab. If this is a Georgian vehicle then the inside of the muzzle break must be painted red with a red rim on the outside, this is not detailed on the sheet. The decal scheme is pretty underwhelming for such an imposing vehicle but from reference pictures this appears to be correct. But it would have been nice for HB to tell us the nationality, instead of having to work it out from number plates. Now don’t get me wrong- I like this kit. There are some low-points but there are few (if any) kits without those and people always have a personal preference for this or that. However, I do genuinely like this kit. I’m impressed by the sheer size that it will turn out to be and of how much detail there is packed into it. The multi-media parts are spot on as well with enough to provide intermediate modellers with a challenge. For beginners I’d say there are too many parts and it would be a tough slog if it was your first or second kit. But overall I have to say it is brilliant to finally have this imposing and interesting vehicle in 1:35 injection moulded plastic and I personally hope Hobbyboss have many more surprises like this up their sleeves! Highs: It’s a DANA...IN PLASTIC! Nicely detailed PE, plenty of crisply moulded plastic and detailed exterior front cab and rear turret as well as a good truck body. Lows: Two-piece barrel, no internal turret detail and some poor information on the marking schemes. Verdict: A triumph of a kit with plenty to get stuck into. The moulds are good and the instructions straightforward if slightly let down by the two piece barrel. Copyright ©2019 text by Karl N. Hoy [ KARL187 ]. All rights reserved. I suppose it all depends on how you define wheeled SPG artillery, but I am sure the German Sd.Kfz 234/3 was a wheeled SPG back in WW2.. Same with the Beford truck with a 25pdr strapped on the bed.. None of this stops me wanting one of these..
S! Mine is already at my bunker. Thanks for the comments guys, much appreciated. As for the price- what I posted in the review was the price Creative Models UK had it on for, and I just converted it to dollars and euros. I got mine from Luckymodel which have it for $52.99/Euro38.03/£36.46. Hobbyeasy have it on for similar prices. I'd also like to clear up something I wrote in the 'Painting and Decals' section. At the time I wrote it I wasn't sure what nationality the vehicle depicted in 'Option II' was. Thanks to pictures posted by Frenchy (http://www.armorama.com/modules.php?op=modload&name=SquawkBox&file=index&req=viewtopic&topic_id=170603&page=1) we can see it is a Polish vehicle as it has the same 'WWR' prefix on the black and white lettering number plate. Also PREVIOUSLY operated by the Czechoslovakia and Russia (USSR). They have both stopped using them. Nice review, looks to be a great buy. Looking forward to getting mine and thanks to both HB for the kit and Panzershop for the resin kit (I bought mine years ago) that had to be inspiration. Can anyone tell me, how long will the completed DANA be?